Bet you didn’t expect to see us with another release so soon! Our team is committed to providing a quality product for our clients. This minor release addresses some issues that impacted clients that had third party products and upgraded before those products had compatible versions. We felt we needed to improve our product in order to avoid any issues with third party products that aren’t updated. This release addresses the aforementioned concern, as well as a few other issues. Fixed issue with edit and delete options not working for Event and Group categories. Added APCu support for PHP 7 that was not working in 4.9. Fixed other issues in 4.9 with PHP 7 compatibility. Fixed CSS errors in Bamboo Theme. 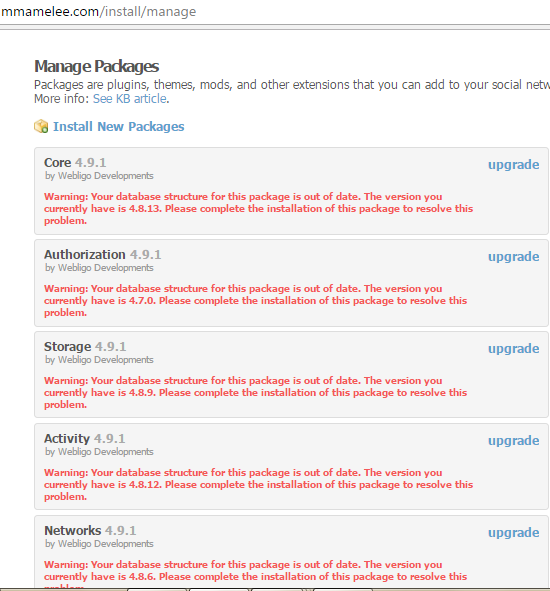 Issue: Third party products which were not updated caused SocialEngine default CSS not to load. Solution: We separated our core CSS from 3rd party add-ons so clients have the base theme loaded to get their site running off the bat. You can also browse the complete changelog for more details about the changes and fixes implemented in this version. You can download your copy of version 4.9.1 from your client account. To upgrade, please view our upgrade documentation or, if you’d rather we take care of the hard stuff, you can order an upgrade and we’ll do it for you. Fresh installs should follow this installation tutorial or you can order an installation ticket and our team will get it installed in no time! Thank you all for your help in posting any bugs you may have found! If you find any more issues, please let us know by filing a bug report in our Public Bug Tracker or by contacting us here. Lastly we’d like to encourage you to stay connected with the community. Great Work Guys. Keep Rocking ! You just won the bet , thank you very much for this fast update, now we are one more step ahead to start building our communities, and this proves again that SE Team is fast, professional and cares about clients! Thank you for your feedback! We are happy to see clients pleased with our progress and releases. my hire-experts plugins dont work this version. is there a solution? You would need to contact Hire Experts for a solution as they would need to update their products. Do I need PHP 7 or will PHP 5.6 work with this new upgrade ? Hi Brent! Our ScialEngine PHP 4.9+ releases are compatible with PHP 7 as well as we’ve taken care of backward compatibility with old PHP versions including 5.6. So, you can use any of these, but we suggest using PHP v7 since it has got many performance based improvements. Thanks. I believe I answered your questions about this in an email. However, just to recap, we do make releases with improvements, bug fixes and updated code from time to time. In most cases, fixes to third party products is just minor updating. If we make bigger improvements, it’s possible third parties would need to also make bigger improvements. It would be up to them whether they charge for those to cover their development costs or release them as free updates. Our last few releases have not caused third parties to charge extra to download versions from what we’ve seen. I believe you posted this also in our Github issue where we have a patch. If that hasn’t helped you, please submit a ticket via your client area so our technicians can assist you. You’ll need to have active support to get assistance with the patch. Hello , I would like to as if it is possible to upgrade a site from 4.8.8 to 4.9.1 ? How the process to upgrade it? Yes you can upgrade. Please follow the documentation linked in the blog above. If you are not sure about doing the upgrade yourself, the link above to purchase an upgrade service from us will have our technicians upgrade your site for you. You’ll want to have checked with any developers of third party products you use to make sure they are compatible with this version or that they have updates. Thank you. It’s great helpful. However, https://www.socialengine.com/marketplace/app/upgrade-service?_ga=2.91871762.987614405.1494564389-2057602455.1477536993 seems do not work. Thank you for posting. You need to log into your account in order to see the upgrade order page.